Experience the sub-tropical rainforest jungle in your private thatched roof cabana on the Belize River surrounded by tropical birds, tropical fruit, the sound of Howler Monkeys, and a natural spring. Adventure to Mayan Ruins, Cave Tubing, Zip Lining, meet the local people and enjoy local delicious Belizean dishes. Note: This lodge is located in the real jungle. Access is by a small boat across the Belize River with a hike up a hill. We are an eco adventure lodge with a small footprint. We have limited solar, composting toilets and an abundance of nature and wildlife. We are paradise to many, but outside the comfort zone of some. Chaya Maya Jungle Lodge is an 80 acre adventure Eco-sustainable Lodge in the Cayo District of Belize located on the Belize River. The lodge has rustic, thatched roof cabanas (palapa, huts, cabins), and a relaxing riverside bar and dining areas. The accommodations are an eco-resort carved gently into the rainforest. We are located in the heart of Maya country. The lodge is a great vacation for family adventures, couples, honeymoons, weddings, group trips, adventure seekers, birdwatchers, backpackers, mission groups, or anyone looking to experience the heart of Cayo Belize. 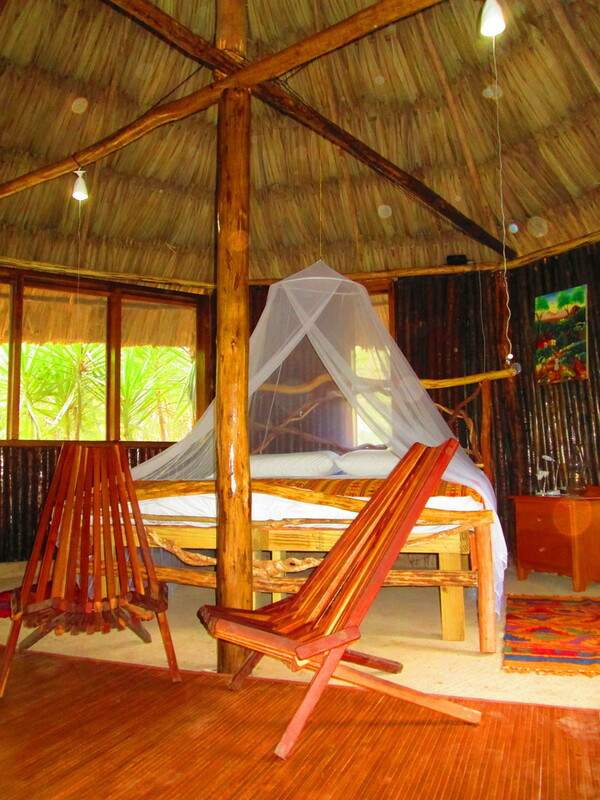 Chaya Maya is right on the Belize River and in the jungle (sub-tropical rainforest). Onsite activities include Canoeing, Tubing, Nature Trails, Relaxing in hammocks, Birdwatching and Wildlife Watching. The 80 acre rainforest is home to Howler and Spider Monkeys, Toucans, Parrots, Armadillos, Jaguars, Peccary, Gibnut, Coatimundi, Agouti, Iguana, Reptiles and many other beautiful creatures. The Chaya Maya Permaculture Sustainable Farm also has an abundance of fruits and vegetables including Pitaya, Chaya, Bananas and Plantains, Limes, Mangos, Avocados, Pineapples, Prickly Pear, Peppers, Craboo, and Coconut. Meals are prepared using fresh ingredients from the farm, when available. The resort is located in the tall jungle canopy which is considered a sub-tropical rainforest.